ASE Certification Program for Mechanics - Auto Craftsmen LTD. In the United States, mechanics are not licensed. Anyone who goes out and purchases some tools can open up an auto repair shop or get a job at an independent shop or at the dealer. A specific shop or dealer may have a great reputation, but most drivers never know which mechanic will be working on their vehicle. You rely on your car to keep you and your family safe and get to get you to work, school and all those other places that are a major part of your life without breaking down on the side of the road. Plus it’s getting crazy expensive to purchase a car, maintain it and replace any broken or worn out parts. Cars are also so technically advanced, that it makes it nearly impossible for you to be able to work on your car yourself. I call them computers on wheels. The mechanic or auto technician who is working on your car is essentially a car doctor. You wouldn’t go to a doctor who wasn’t a licensed M.D. So, how can you be sure the car-doctor / auto technician working on your car has the experience, expertise and skill to be repairing and servicing your vehicle? Since 1972 The National Institute of Automotive Service Excellence or ASE has set the industry standards by testing and certifying automotive professionals. ASE Certifications are a valuable yard stick by which dealers, independent repair center owners and service customers can measure the knowledge and skills of individual technicians before contracting the technician’s services. To achieve ASE Certification, technicians must show the appropriate work experience and pass one or more ASE developed tests. specialty tests for hybrids, diesels, service consultants and for parts specialist. Each certification will help you identify and recognize the skill level of your technician in the specific repair or service your vehicle needs to be safe and reliable. 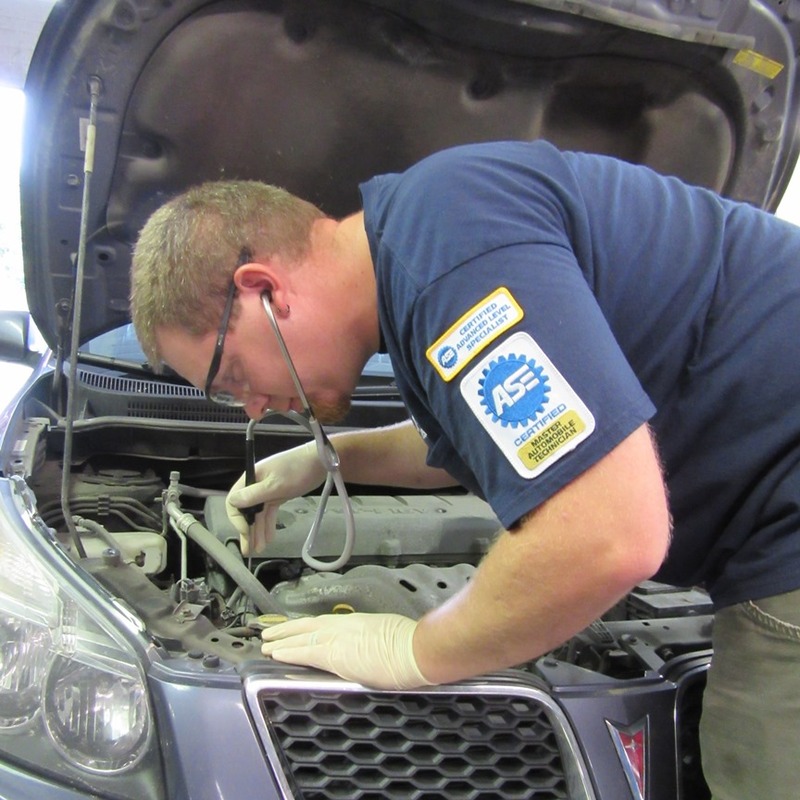 For each exam that is passed, the auto technician receives a certification for that system and receives an ASE Certification patch. The test questions are continually changing to reflect the new technology and each test needs to be retaken every five years to maintain the ASE Certification. As you can see below, there is a progression of the certification process to distinguish what level of skill your auto repair technician is at. If all eight tests are passed anASE Master Technician Certification is awarded. Master Techs are considered experts in automotive repair. ASE also has an Advanced Engine Performance Specialist test and Certification. These technicians are like medical specialists such as Cardiologists or Surgeons. They diagnose and repair the most complex engine performance problems and deal with the sophisticated on-board electronics that drive modern cars. Repair establishments with just one ASE technician on staff who only have one certification are permitted to display the ASE sign on their building. 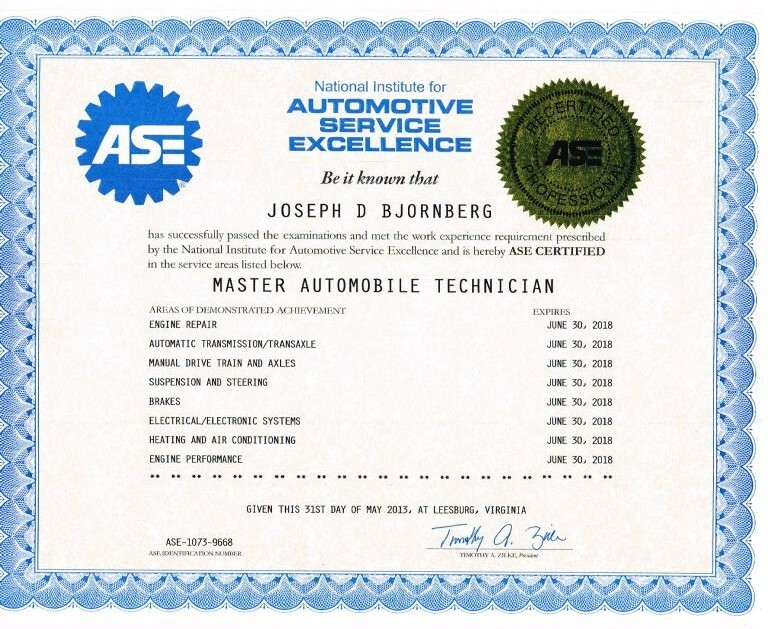 To find out what certifications the auto technician really has, you should look for the certificate of credentials that ASE provides and should be hanging up on display in the office or waiting area. If you don’t see any credential certificates just ask. Most technicians are proud to share their expertise and ASE Certifications with their customers. If repair facilities are going to provide you with excellent automotive repair and care, they need to hire the best in the industry. The ASE Certification program helps you understand their staff’s level of skill, experience and dedication to their jobs. vehicle that you and your family invested in and safety depends on. Auto Craftsmen is proud that we have been an ASE Blue Seal Shop for six years.